A Middle School Survival Guide: Birthdays in middle school? I got thinking... Maybe I need to do more for THEIR birthdays. It's something I just never considered... And something I previously thought of as being very elementary-school-ish. But I guess maybe it isn't. We are limited on parties, holidays and food in the classroom--not to mention the fact that some families at our school don't celebrate birthdays. 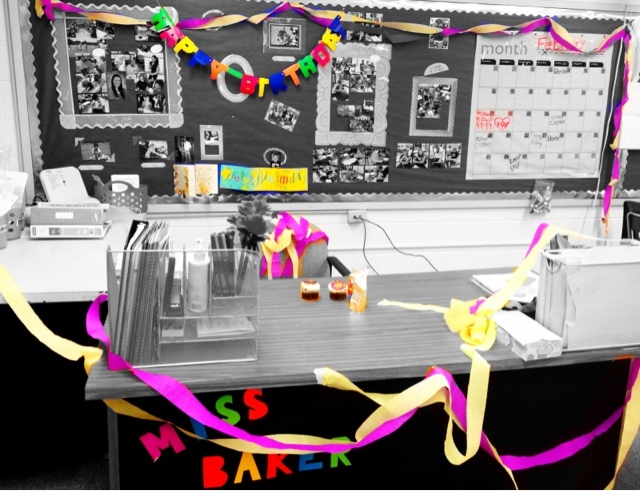 I teach 7th grade and for student birthdays we give them a pencil that says, "Happy Birthday from your blue house teachers" At the beginning of each month we put birthday signs on the lockers of all students who have a birthday that month. All the core teachers sign the birthday sign. Kids love having the sign on their locker. Next year we are going to give the kids the big pixie stick type things with the balloon attached. I know the kids will love those! I give each of my students a NoHomeworkPass for their birthday (or half birthday for June/July/August). I give it to them the month of their birthday, but they can use it at any point in the year after that. It's a nice (free) way to recognize that they have a life outside of school and sometimes a family celebration doesn't have to interfere with schoolwork. I really like that idea Susie! For some reason I think I remember you mentioning that before, but must have forgotten! I might have to steal it next year if that's OK with you! I have pixie sticks with balloons attached to them for birthdays. This year my class asked if we could have a big birthday party for everyone, so I believe that at the end of the year we are going to have a big party...they even want to be able to bring gifts in. We're still ironing out the details. I teach grades 7/8 self-contained, but having birthday parties is too disruptive with my group, so if they want to bring in cupcakes, they eat them at lunch. My assistant goes to lunch with them, so she handles the lunchtime "party." I give them birthday pencils, and write a happy birthday message on the board. Our school also gives the kids ribbons to wear on their birthday. I like the homework pass idea too! I found some Happy Birthday clings over the summer. This year I made a little section on the white board for birthdays. I also found these little paper bands for their wrists. The girls love it; the boys are worried about "birthday licks". Old students come back to my room and complain "you didn't do that for us" so I guess they like it. I teach 6th grade at a middle school. I am a 6th grade science teacher at a middle school in South Carolina. Since I average around 120 students, I sing the happy birthday song to each student on their special day. This is no ordinary song though. I have my students pick a genre or style of music and I sing it in that style. For example, I have sung the song in the style of rap, rock and roll, even Disney princess. It's a blast and sometimes ludacris on my part, but the kids don't forget it!